Sometimes people like a bag that looks a little different, feels a little different and is worn a little differently. The next few bags offer a little bit of all. What is your style preference? The first one goes back to the Computer bag category but looks and wears as a backpack or shoulder bag. Our next Backpack is the Sling style allowing you to wear it over your shoulder. Arcturus Sling Backpack in black-red or black-royal. 13W x 20″H x 6.5″D. Trendy uni sling design. The New Arctrus Sling has room for everything. Durable 1680 Denier polyester body fabric. Modern design with comfortable padded single strap. Heavy duty zippers and sliders. Large side compartment and organizers, front and side pockets. Sling can be changed for left or right shoulder carry.”. As low as $31.00 . Very stylish. The Playmaker bag, I just love this name. has the look and feel of a messenger bag which appears to be becoming more popular again. I love the Write-On, Wipe-Off Board with included pen for that something special and added touch. Hence the name of the bag. The Playmaker messenger bag is the most versatile bag in the industry. 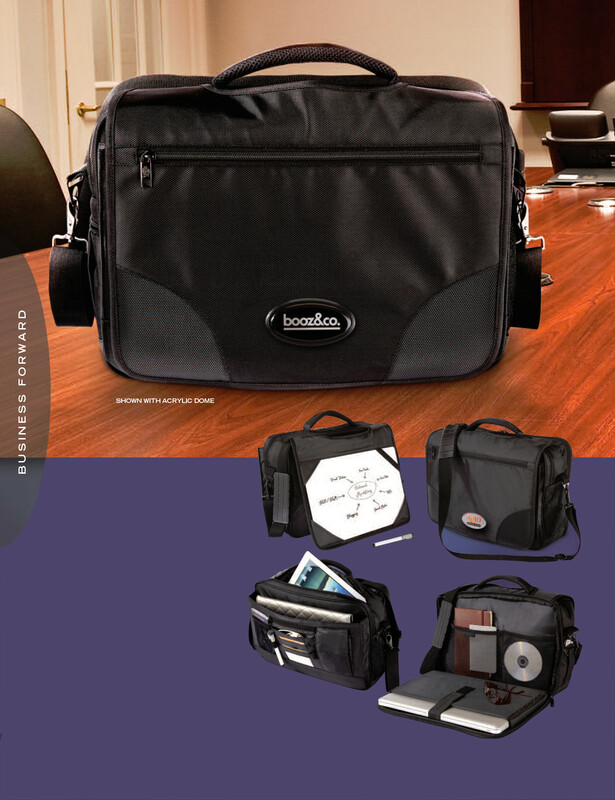 This professional all-in-one bag solution features a large main compartment with sleeves for laptop and tablet. It has a durable ballistic style fabric body with shoulder strap pad and matching black hardware. It also includes integral write-on, wipe-off board including pen for meetings and impromptu presentations. Magnetic flap opens to reveal a dry erase board (pen included). Measures 12″ h x 16.5″ w x 6″ d with 1680 Denier Polyester material. Additional Information Additional Features: Convenient zippered outer pockets; Padded tablet holder notebook compartment and organizer pouches with felted Smartphone pocket; and dedicated laptop sleeve (up to 17″) with even more see-through organizer pockets. BK for Black. As low as $39.00 – a bargain. Sometimes catalogs show items better than a website, this picture does not do it justice. Another great messenger bag is the City Compu-Case. Take your valuables in comfort and style wherever you go! The City Compu-Case is constructed out of smooth microfiber with trim styling, making it both durable and distinctive. Features a suspended cushioned laptop sleeve sized to accommodate most 17 computers and padded grab handles. The padded shoulder straps are adjustable and removable, ensuring versatile comfort while you travel.” As low as $29.00. Stylish and sleek. Last but not least is out City Compu-Pack upright Computer bag. Take your valuables in comfort and style wherever you go! The City Compu-Pack is both durable and distinctive. Features a padded laptop sleeve sized to accommodate most 17 computers and comfortable shoulder straps. Designed with an ear bud port and additional pockets for organizing cords, files, and other small articles.”. As low as $27.50. You can’t go wrong with any of these bags. I can’t decide which one I want most. Can you?